I have a fun nautical baby shower craft for y’all today. 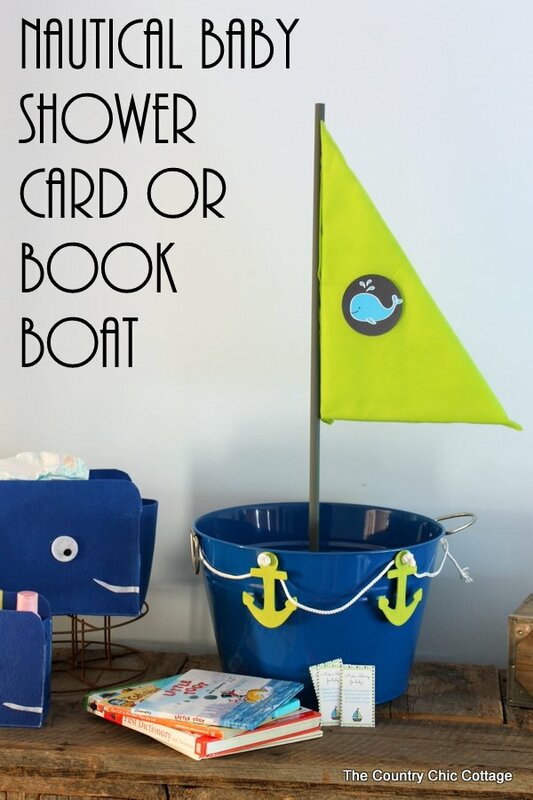 Turn a metal tub into a boat that can hold the cards or books that guests bring. I am throwing a baby shower for my daughter in a few weeks to y’all expect there to be tons of whale inspired crafts around here! We are actually including an insert with the invitations asking guests to bring books instead of cards. I have included that printable for y’all below as well. This is a hangout on air brought to you be Adtech adhesives. The project and opinions are all my own however. I filmed this hangout a few times and this is the best shot I had. You can watch the 10 minute video below where I put together this little tub boat. It is a really simple project. If you have trouble hearing or seeing the video, I will walk you through the basics below. Links may be affiliate links where a portion of your purchase goes to support this site. The tub is from a local store. The mast is a dowel stuck into a block of foam. I painted the entire thing grey and used my Adtech glue gun to glue it into the tub. The sail is a large block of Styrofoam cut into half diagonally. I used a foam cutter but a serrated knife will also work. I used oly*fun to cover the sail. Just fold around and secure with hot glue on the edges. Only use a small amount of hot glue as it will melt both the foam and the oly*fun. 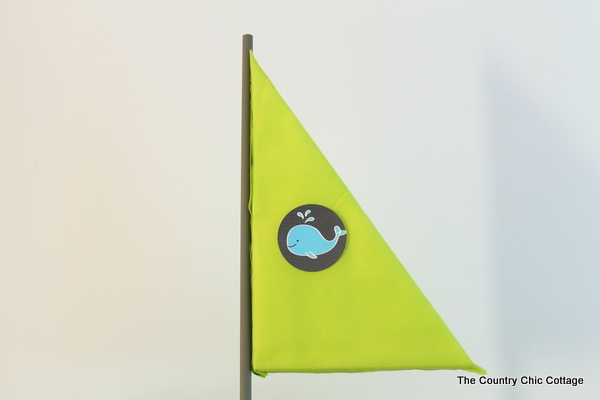 Add the printable whale to the front and back of your sail. Click here to download the free printable whale for your project. 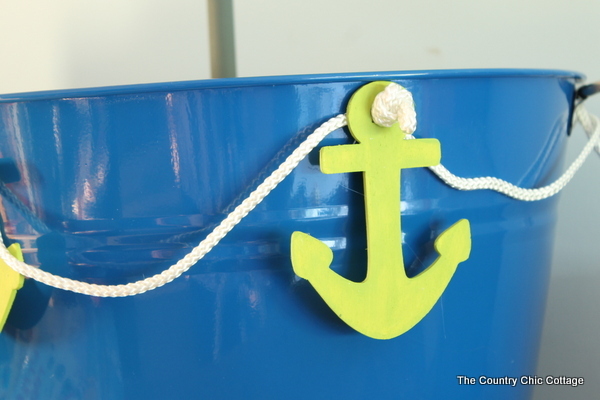 Add painted wood anchors and some rope around the top of the tub with hot glue. Add this to your nautical baby shower decor! Now if you want to add an insert to your invitations asking guests to bring books instead of cards, I have that for you as well. I made the nautical themed version that you see below. This is intended to print on an OL1443 from Online Labels. I work with them regularly and they sent me some of these free of charge. They are great because they are perforated and you can tear them into cards easily. If you don’t purchase the perforated sheets, just print on card stock and cut with a paper cutter. Click here to download the file and print your own. 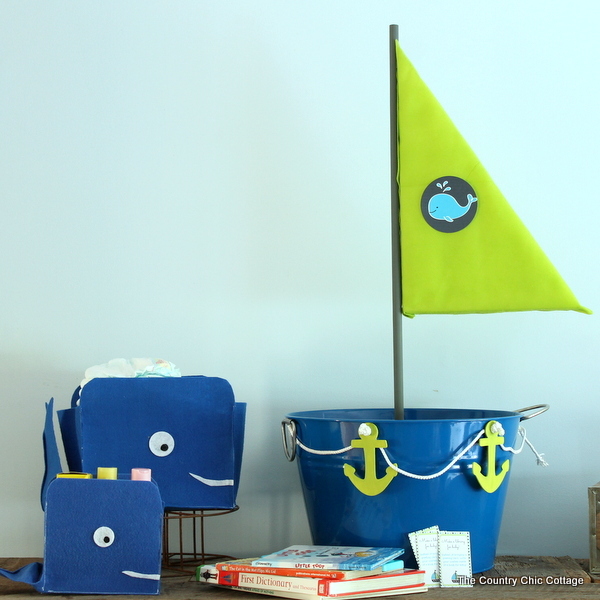 This fun nautical baby shower craft is easy to make in just minutes. Grab your supplies today! 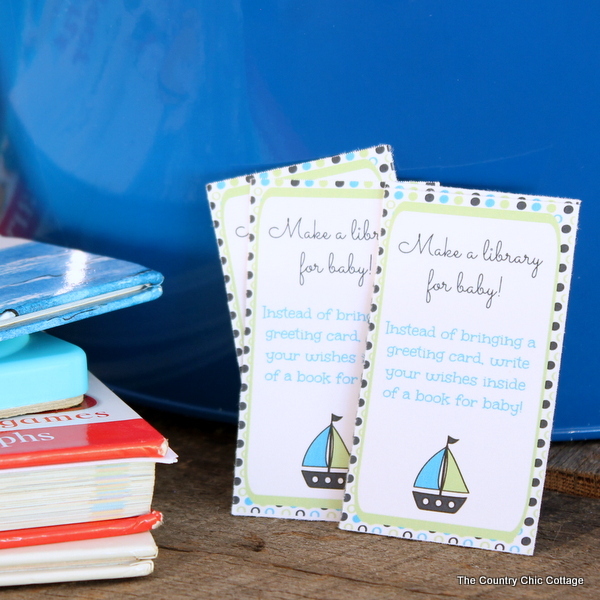 This is just perfect for cards or books brought to the baby shower. If you are throwing a shower or planning a nursery, be sure to stick around here over the next few months as I have tons of plans y’all! Do you love those little felt whales? Click here to see how to make those yourself as well! Definitely Anna! You can get the ones I used from this link (it is an affiliate link): http://shrsl.com/?~bz86.